One of the great things about this project is how much I learn as I do it. The thing about learning so much is that I’m constantly discovering that I was wrong in my assumptions when I started. Towards the beginning of the blog, I wrote a piece on “Studios in 1914.” I didn’t really say anything that was inaccurate then, but I had based it on a somewhat inaccurate theory. My idea was that since moving pictures were so new, there would only be a fairly limited number of companies involved in making them. This idea was reinforced by familiarity with the later Studio System, in which a small group of big players dominated and made it hard for anyone start a new company, and by the knowledge that the Edison Trust was fighting hard to keep competition to a minimum. Now, that all makes sense, but it’s just not how things were at all. Turns out that there were dozens of small-to-mid-sized operations at any given time, especially once the Nickelodeons got up and running. In fact, what really created the major studios of the future was the consolidation and selling of these little guys to one another. The studios we know about, like MGM, Paramount, and Universal, are actually conglomerates of several smaller businesses that unified in order to gain distribution opportunities. Keeping track of the buyouts and mergers gets dizzying, but also adds to our understanding of the history of the movies. With all that in mind, this post makes no claim to give a complete picture of all the studios and production companies in operation in 1915. Instead, I’m going to give a partial snapshot of some of the companies I missed last year, along with an update on some of the more interesting ones I did cover. Since I already mentioned them, let’s start with an update on the Edison Trust. We could see it as sort of a failed prototype for those mega-conglomerates I talked about above, because it’s not one company, but several, who up to now have claimed to “license” all legitimate motion pictures in America. Well, in the trust-busting environment of the time, it was fighting for its existence in court, and wound up losing in October, when a federal court ruled it an “illegal restraint of trade.” After that point, there was an appeal, but no one took the Trust seriously anymore, and it finally disbanded in 1918. This also led to the end of their distribution network, the General Film Company (which was not a producer, as I wrongly stated last year). Things aren’t much better at the Biograph Company at this time. They were a part of the trust, so this litigation hurt them, too, but they were already crippled after the departure of D.W. Griffith and his stock company of actors and cameramen in 1913. By 1915, they were reduced to issuing reissues of classic Griffith shorts, along with longer pieces by him they had let sit on the shelf as punishment for trying to force them to release feature films. While these proved more popular than their dwindling new material, it wasn’t enough to keep the company alive, and it closed its doors before the year was out. You might think that Keystone Studios would have suffered as badly after letting Charlie Chaplin walk out at the end of 1914, but Mack Sennett continued to produce cheap, popular comedies with Fatty Arbuckle, Mabel Normand, and the Keystone Kops. also striking on the idea of the “Sennett Bathing Beauties” this year, who became a hit, even if not as big a hit as Chaplin was. Keystone joined Griffith and Thomas Ince in the new Triangle Film Corporation, which marketed itself as the “upscale” artistic movie distributor. Meanwhile, Chaplin had moved over to Essanay Studios, who promised him $1000 a week. By the end of the year, this was not enough for the star and he moved again, but not before producing great films like “The Tramp” and “Burlesque on Carmen” which showed his improvement as a director and maturity as a comedian. Essanay’s name was a play on S&A, after its founders George K. Spoor and Gilbert M. Anderson. Anderson was also known as “Broncho Billy,” and was star of hundreds of Western shorts. During 1915, they also signed Francis X. Bushman, a talented actor on his way to stardom. 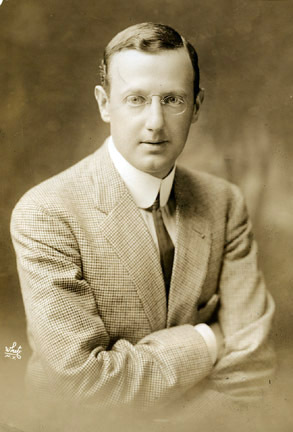 Jesse L. Lasky in 1915. The last American company I want to talk about is the Mutual Film Corporation, which brought out “The Birth of a Nation” in 1915 through one of its subsidiaries, Reliance-Majestic Studios. While “Birth” was a huge hit, Mutual had some problems, including litigation and censorship. Mutual’s name is on the landmark case “Mutual Film Corporation v. Industrial Commission of Ohio,” in which the Supreme Court ruled that motion pictures were not subject to First Amendment protections. This, along with the defection of Reliance-Mutual to co-found Triangle later in the year, was a major setback, but they won a major coup in hiring Chaplin when he left Essanay, and today they are associated with most of his most popular shorts. Again, this blog has a tendency to be more American-centric than I really want (that’s “where the light is better,” in film history, I’m afraid). But, let’s spend a little time catching up on some companies working in other countries. In Russia we have Khanzhonkov Studios, which I’ve sung the praises of in connection with Evgeni Bauer and his fascinating films. Khanzhonkov also had animation pioneer Ladislav Starevich, who I hope to bring to this blog in coming months. Its owners were Aleksandr Khanzhonkov and Vasily Gonchorov, who had made the nationalist hit “Defense of Sevastopol” in 1911. They seem to have valued directors more than most American concerns, and made Bauer a partner in the concern, rather than argue with him over his pay. In Japan, which is regrettably unrepresented on my blog so far, the company Nikkatsu has been in business since 1912, when it was formed from a merger of several smaller studios. I believe Shozo Makino was working there in 1915, although at this time he’s in between remakes of “The Loyal Forty-Seven Ronin,” probably Japan’s most frequently remade film story. Japan’s film industry had an interesting appendage at this time, the benshi, or narrator, who would appear at screenings to explain what was happening on the screen. These men were often bigger stars than the actors in the movies at the time.